Like the frog that doesn’t notice he’s boiling in slowly heated water, it’s easy to become immune to the amazing or strange things that surround us all the time. Lucky for me, whenever I swap from one world to another, I get to enjoy observing those little forgotten things over and over again (the rather less enjoyable side is called [reverse] culture stress but I’ll write more about another day.) Now that I’ve been in the US for two weeks (I'm starting my home assignment, after a couple of years in Papua New Guinea), here are a few of the things that have stuck out to me. People like to watch the weather on TV and read weather forecasts on the internet and listen to weather people on the radio, and then plan life accordingly. In Papua New Guinea (PNG), we just assume it’s going to rain, and voila! Forecast is done. The leaves of Minnesota trees are super small. Like dollhouse leaves. How cute. In PNG, the rainforests are dense, dark environments, where the light struggles through the top canopy and there is so much groundcover and ginormous ferns and other tropical plants that you can’t see much ahead of you, and you need a bush knife to clear the trail. Here, the forests are much more open and spread out, and light radiates through the trees until everything is glowing and magical. Houses are anchored solidly on the ground and are so tightly sealed that outside sounds are very muted and the air feels processed. However, the house itself is incredibly noisy with dishwasher sounds and water softeners and heaters and fans and other such creative inventions. Air conditioning is super cold. We can do laundry in the evening!! (In PNG, it takes hours and hours to do one load of laundry, and with no dryer, you need to start early enough to catch the sun). There is this household chore called vacuuming. Even the airports are fully carpeted!! People put ice in their water, and they FILL ENTIRE COOLERS with ice when they have a party!!! Whoa! No one comes to your house uninvited. No one walks by and stares in, no one stops at your gate to bring you 5 bags of lettuce and ask for help with dental fees, no one shows up to ask if they could borrow sugar, a ladder, and would you want to play croquet this afternoon? It’s…weird. The sun is very weak. I could be out in it and my skin wasn’t frying instantly. Maybe that’s why the same temperature here feels much warmer in PNG. Thunderstorms are rather pathetic, umbrellas actually keep you dry, and even better, because houses aren’t built with tin roofs, you can actually carry on a conversation when it rains! We get junk mail! Actually, we get mail at all!! There is wifi on airplanes and on roads and in cities! No one stares at you when you walk down a street. They seem to think you look normal and are doing a normal thing. I don't attract an audience here! The sun bizarrely stays light until 9 or 10 pm…and dusk lasts for hours! (PNG is 12 hours of light—from 6am to 6 pm, and it varies about 15-20 min from “summer” to “winter”). Store aisles are incredibly wide, well lit, and the floors are so clean, you could have a meal on them. Spices are spicy, and cling wrap clings. I can’t tell you how exciting that is. Seat belts work. There are seat belts in the first place. We’re not going to talk about the incredible thing that is a grocery store. Or clothing store. We’re just going to revel in it. When I started making the list, I found I couldn't stop at 20! So check back next week for yet another 20 bizarre and awesome qualities of first world life. I am a tea drinker, not a coffee drinker. While I can manage to choke down a cup of java to be social (an important skill for both living in a Papua New Guinean village and for sitting down with American church missions committees), not even spending my college years rooming with a passionate barista convinced my tastebuds to crave this bean-water. 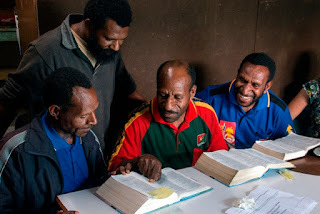 But in mountains of the Papua New Guinea (PNG), coffee growing and production is a vital part of industry, and for the Kamano-Kafe translation team, it’s a critical pillar of support for Bible translation! 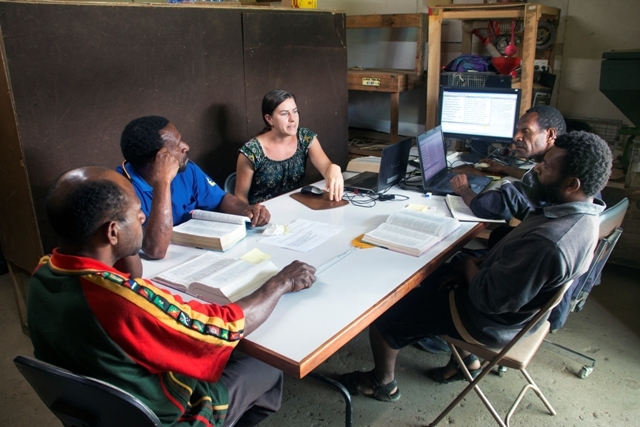 In 2010, the Kamano-Kafe translation team faced challenges of rising costs everywhere, including transportation, which meant some members were unable to attend team checking sessions. Rich, their team advisor, started wondering if they could save the money they spent on buying ground coffee for their daily coffee break by processing and roasting the coffee beans themselves. Many Kamano-Kafe speakers tend small plots of coffee trees next to their other staple crops of kaukau and taro (two kinds of root vegetables). Family members hand pick the bright-red fruit of the coffee trees (called cherries). After the flesh has been removed and the cherries are washed, sorted, and dried on big tarps, they sell the beans (now called parchment) as a source of income for the family. The green beans are then stored in loose woven bags until it’s time to be roasted. Green beans all ready to be made into delicious (so I've heard) coffee! At first Rich tried roasting coffee on the stove using various pots and pans (and even a whirly popper, which filled the house with smoke!). The team started selling a few small bags of coffee here and there, hoping they could cover their costs and perhaps help with a few team expenses. But God blessed their efforts and the demand for coffee increased. Rich realized the stove-method wouldn’t cut it, and after lots of internet research and the collaboration of several machinists, he designed from scratch a 3kg coffee roaster. In the beginning of learning to roast, there were a few mishaps. Nathan, a translation team member and now an expert in bean roasts, recalled over-roasting a batch of beans, which then caught on fire. “It lit up like kerosene!” he remembered. “The flames suddenly shot toward the roof and smoke filled the building.” In a panic, Nathan threw the flaming batch in the cooling tray outside and watched it crumble into charcoal. “Without mistakes, we couldn’t improve!” laughed James. James and Nathan, the chief roasters, continue to refine their dark, espresso, light, and medium roasts and experiment with improving flavor. Currently, the sale of two 250g bags of coffee pays for all the stages of translating one verse of the Old Testament into the Kamano-Kafe language. In addition, the coffee beans are purchased from Kamano-Kafe speakers who are facing need and hardship, such as widows and the sick, in order to help their community. Come to market--buy some freshly roasted beans, and have them ground as you wait! God continues to bless the sales of coffee to support the Bible Translation project (sold to only local coffee aficionados...so you need to come to PNG for some awesome coffee! ), and recently the team purchased a used 5.4 kg roaster, which will allow them to meet the ever growing demand. I think it’s time for even this tea drinker to sip a cup of coffee! There is no such thing as a normal day of translation! But, here’s an example (including all real events), of what a day might look like! Don’t forget to read Part 1, posted last week! The table goes silent, then Nathan bursts out with a grin. “Ooo, Brother, she knows what you’re saying! She’s holding your tail now! Watch out!” We all double over in laughter. The horn blares again, signaling an hour lunch break. As the team fixes their rice and tin meat, I head back to my house for a quick meal and as much horizontal rest as I can between phone calls and people stopping by. Back to translation! The metal roof has no insulation, and under the intense tropical sun, the little building heats up like an oven. The power flicks on and off, so computers and lights suddenly go black, but the team doesn’t miss a beat. We shift some sentences around (in Kamano-Kafe, the verb comes at the end of the sentence) and adjust a letter or two (Kamano-Kafe uses lots of suffixes to communicate meaning, which means words can be quite long and a single letter can change the entire thing from past to future or from intentional to accidental). “Ah yes, that’s a lot like our culture” Kosseck comments, and all the guys begin to chime in on the taboos surrounding women’s menstruation and childbirth. But soon we’re back to discussing how to keep an army camp clean when you’ve got thousands of men in one place, and my chronic fatigue is making it hard to focus. Another horn—afternoon tea break! I pray to close the session and my brain mixes all three languages together until I spit out something only mildly coherent. “I should dump some water on your head,” teases James. “No, then he’ll just be full of steam” retorts Tuas. We all laugh, and head to the communal office where we flip through ancient National Geographic magazines and tackle some financial paperwork while we sip more coffee. Franky peers over Kosseck’s shoulder at the giant boa constrictor strewn across the photos. “Did I ever tell you the story about the snake...?” and suddenly, he launches into story after story about giant snakes and bats wrestling in the treetops or when eagles dropped a snake carcass on a truck-load of people. Back to translation, and we open in prayer just as the dark storm clouds break above us and rain pounds the uninsulated metal roof. We can barely hear each other over the deluge, but we shout translation at each other anyway (it’s a good test of language comprehension, I muse to myself). One verse doesn’t need any changes—“Hooray, free verse! Free verse!” we shout! There is no such thing as a normal day of translation! But, here’s an example (including all real events), of what a day might look like! Check back for Part 2 next week! Nanterane! Good morning! It’s 8:30 am, and I step into the canteen, a little brown building that triples as trade store, coffee roaster, and translation office. James and Tuas, two of my Kamano-Kafe colleagues are already there, but I hear “Heeeey, we come!” and the rest of the team, Nathan, Kosseck, Korry and Franky spill in after me, everyone shaking hands and slapping backs. Pastors, elders, fathers, youth leaders—they represent five different denominations coming together. 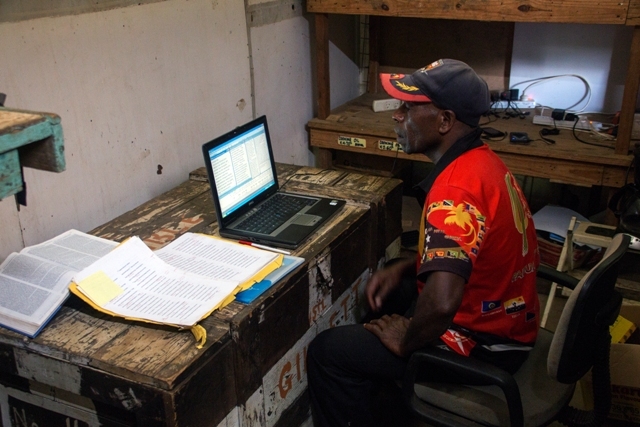 James begins hooking up computers, and Tuas distributes Bibles. Franky, a mother-tongue consultant, settles into the side room to work on adding his comments to an already team-checked translation. On to translation! James, our typest and “driver,” clicks open Paratext, the language software that holds all the translated material, and the passage where we left off last week appears on the external screen for all to see. This year we’ve been working our way through Leviticus and now we’re in Deuteronomy. “We used to do this all on paper!” he grins. “This screen makes it so much easier! By the time the passage reaches the team check, it has already gone through two drafts. 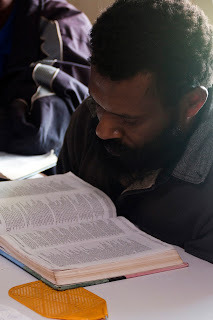 Now Kosseck reads aloud in Kamano-Kafe while Tuas immediately translates into Tok Pisin, the trade language of Papua New Guinea, so that I can understand. 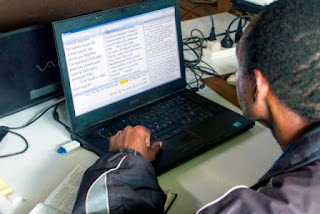 I follow along in my Bible—four parallel versions, while glancing at various commentaries on my computer, as well as the Hebrew text and 7 other Bible versions on the main screen. A good translation is clear (communicates everything without any confusion), accurate (contains all the meaning of the original), and natural (sounds like a native speaker). My job is to listen closely and ask questions to confirm we’re sticking to these principles. “Who is speaking?” I ask. “Moses!” the guys chorus back. I glance through my notes and re-read the passage. “Actually, the context indicates this is actually God talking.” We discuss it some more, then add in an extra phrase: Ra Anumzamo'a huno. The Big Lord said. We continue through the rest of the passage, word by word, verse by verse. Sometimes everything flows smoothly, and sometimes we spend upwards of 15 minutes on one verse, poking at it over and over, restructuring, arguing, linking it to previous verses and trying to bridge three different dialects. We discuss spelling issues, I explain difficult English words, and we reword English passives (e.g. "the law was passed") to a more natural active construction in Kamano-Kafe ("the Israelites passed the law"). 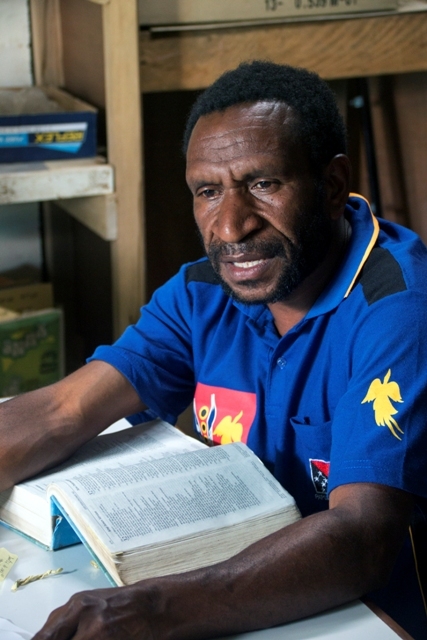 “Wait, let’s check,” says Kosseck in Tok Pisin, “What does worn out mean? Does it mean just torn or completely torn off and falling off the body? Does it mean you force and tear it or does it happen naturally?” We change a few more words around and re-read the verse a few more times in Kamano-Kafe. Okay, one more time to rekreo (translate it into Tok Pisin again so I’m able to confirm the changes). We open and close every session with prayer. 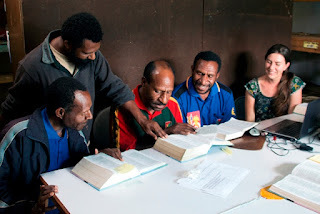 Suddenly it’s 10 am, and the Ukarumpa linguistic centre horn blares. We pray to close the session, then stretch, shift in our hard metal chairs. It’s tea break! The men head off to the Highlands office to drink coffee and chat with another language team who are recording word lists. I take advantage of our 15 minutes to run to the other side of centre and tackle various errands for the team, including the post office, finance office, and our computer repair services for Franky’s computer. We’ve only reached 10am (and I didn’t tell you about everything that happened before I made it to the office, including an 80 year old man with only four teeth who needed to see the dentist showing up spontaneously at my house! Check back next week for the rest of the day!